A Chilton family tradition, first recorded in 1744, tells of 12-year-old Mary Chilton racing to the front of the launch that was bringing the Mayflower passengers ashore for the first time. She stepped off the boat and was the first female to set foot on Plymouth Rock. 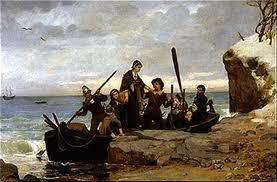 Mary Chilton arrived at Plymouth with her parents on the Mayflower in 1620. Her father James Chilton, listed as 63 years of age, died aboard the Mayflower while it was anchored at Provincetown Harbor, about a month after they arrived. One of the first English women to arrive and help provide a home life in the rugged Virginia wilderness was fourteen-year-old Anne Burras. 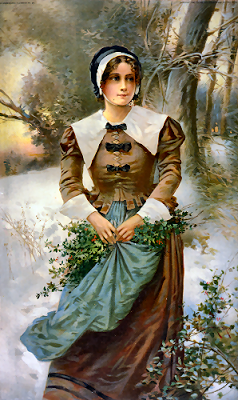 She was the first unmarried English woman in the New World, the personal maid of a Mrs. Forrest who came to Jamestown in October 1608 to join her husband, Thomas Forrest. At that time, Jamestown was a fort of about one acre in size, with one storehouse and one church, described by John Smith as looking like a barn. It was the home of about 200 men. The houses were described as shacks that looked ready to fall apart. In 1587 an expedition organized by Sir Walter Raleigh established the first English colony of 117 people in the New World – on the island of Roanoke off the northeast coast of present-day North Carolina. 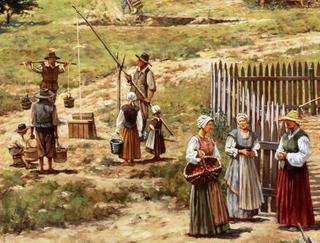 On August 18, 1587, just fifteen days after the colonists had arrived and established what would become the Lost Colony of Roanoke, the first English child was born on American soil. 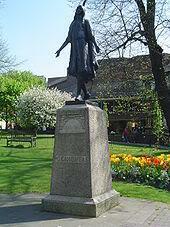 Her name was Virginia Dare. On March 25, 1584, Queen Elizabeth I granted Sir Raleigh a charter to establish a colony in North America, or lose his right to colonization. On what is now called the Outer Banks of North Carolina, Sir Walter Raleigh established three separate colonies on Roanoke Island.